Greenland Ice - Universe Galaxies And Stars Section. Southern tip of Greenland. Image credit: NASA. 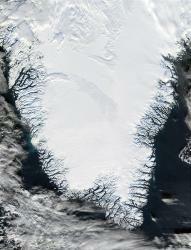 NASA's GRACE satellites have measured an increasing rate of ice melt in Greenland. According to new analysis by researchers at the University of Arizona at Austin, the loss of ice from Greenland's southeastern region has sped up between 2002 and 2005. Approximately 239 cubic kilometers (57 cubic miles) is now lost each year. Greenland contains 10% of the Earth's fresh water, and this melting ice is contributing 0.56 mm (.02 inches) to globally rising sea levels. "Our latest GRACE findings are the most complete measurement of ice mass loss for Greenland," said Tapley, director of the university’s Center for Space Research (CSR) and holder of the Clare Cockrell Williams Centennial Chair in Engineering. "The sobering thing to see is that the whole process of glacial melting is stepping up much more rapidly than before." "These findings are consistent with the most recent independent measurements of Greenland’s mass done by other techniques like satellite radar interferometry, but in this case they provide a direct measure of ice-mass changes," said geology Professor Clark Wilson, a co-author on the latest Science article who helped analyze the estimates for Greenland. Wilson chairs the Department of Geological Sciences at the university and holds the Wallace E. Pratt Professorship in Geophysics. "If enough fresh water enters the Norwegian Current," Tapley said, "and you interrupt return flow, then there could be climate effects in Europe." "By using this special filtering procedure," Chen said, "we teased out additional details of mass changes in Greenland along its Southeastern and Northeastern shores separately." "This melting process may be approaching a point where it won’t be centuries before Greenland’s ice melts, but a much shorter time-frame," Tapley said, noting that it isn’t possible to tell how much sooner this will be.